Acoustic Guitar Vs. Electric - Which Should I Learn? Acoustic Guitar Vs. Electric – Which Should I Learn? Beginners can often dream of playing their guitar to thousands of people in a stadium and really rocking out with a blistering solo. However, novices will often be learning scales on an acoustic guitar and the gap between the two can seem insurmountable. However, when learning the guitar, remember that you are in charge. It is quite possible to teach yourself to play and to develop your own style along the way, so you should choose the sort of guitar to learn on – electric or acoustic – that you actually want to perform with. All you need to do is to try and minimise the number of bad habits or lazy techniques that you pick up along the way, since these will slow your progress from being an intermediate player to becoming a top-quality guitarist. Don’t worry about such things too much for now, however, because there are plenty of online tutorials that you can view which will keep your technique on the straight and narrow. Choosing which sort of guitar to learn on does not necessarily need to boil down to a choice between acoustic or electric. You could, of course, spend time perfecting your chord changes and melody playing on both sorts of instrument. Many of the techniques you need to pick up in order to play a guitar will be exactly the same no matter whether you happen to be using an acoustic guitar or an electric one. Nonetheless, there are some differences between the two instrument types that can be lost on novices – and it does not simply come down to the sort of sound that they make, either! When choosing your first guitar, it is most certainly a big decision. Choose wrongly, and you could find that you are put off learning all together. As such, it is highly advisable to try a few guitars out, even if you don’t know any chord shapes or strumming patterns, to get a feel for the differences. Try a few models of each type in a guitar shop before making a decision or, even better, ask to borrow a friend’s acoustic guitar for a few weeks before swapping it for an electric one to see which you get along best with. One of the most important things to consider when you are weighing up whether to choose and acoustic or an electric guitar is when and how you will practice with it. This really comes down to the sort of lifestyle you have. Acoustic guitars are often preferred by beginners because they can often be that bit cheaper and you don’t have to worry about any additional equipment. Acoustics are ready to go, once strung, but an electric guitar needs a strap, if the body shape means that it will not sit over your knee properly. 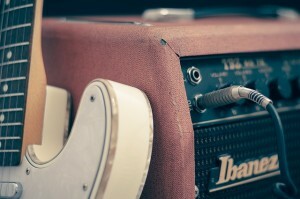 In addition, electric guitars need a lead and an amplifier to make a decent sound. If you opt for an electric guitar and an amp, you may need to spend more, but think about the impact on others around you when you play it. If you don’t have a sound proof studio to play in, will consideration for others around you mean that you rarely plug it in and mean you practice less often? On the other hand, despite acoustic guitars often being quieter than an amped up electric guitar, it is impossible to turn it down, especially when you want to play late at night. All you can do is to hit the strings with less force to play as quietly as possible. With an electric guitar, at least you can unplug it and play nearly silently on it without amplification. Remember that many guitar amps will have headphone jacks. This means that you can also get that amp sound, great when you want to rock out, without having to disturb anybody else. Complete novices often opt for an acoustic as their first guitar and this may apply to you, too. Relatively inexpensive, unless you immediately jump to a very high-quality model, they are usually perfectly good to learn on. Acoustic guitars offer a distinct advantage in that they can be performed or busked on without any additional equipment being required. So, if you learn your first three-chord song and want to try it out with family and friends, then you can do without needing anything else. With an acoustic guitar you don’t have to worry about adjusting the tone pots, knocking the tremolo bar or fiddling with amp settings. You just pick it up and play. This simplicity can be very appealing when you are learning and getting your fingers used to moving up and down a fretboard for the first time. Steel-strung acoustic guitars are not very different in feel from electric ones. They may have a slightly higher action (the distance between the fretboard and the strings) than an electric, often to make them sound louder, but the difference in feel on your fingers will not be very noticeable if you later want to move on to playing an electric guitar. Conversely, classical guitars do feel very different. This type of guitar often has a slightly wider neck than an electric, making stretches a little bit more demanding. However, this is more than made up for by the fact that the strings are easier to push down on than steel-strung instruments. Beginners usually benefit from this until their finger tips toughen up and get used to the amount of pressure required to make a string sound properly, when struck. If you want an overdriven sound with lots of sustain, then learn on an electric guitar from the start. Equally, if you want to develop a style with lots of vibrato, then choose a solid body guitar which can cope with a tremolo being bolted on to it. If you already know what sort of guitarist you aspire to be, then why learn on another sort of instrument, only to have to re-learn your techniques later? Electric guitars offer more advantages than their sound. Although heavier, they are usually a good deal sturdier than acoustics and will stand up to a bit more punishment. They can often be easier to restring, too, depending on the particular model you opt for. Finally, an electric guitar is often thinner than an acoustic, so it is a bit easier to see over the top and down to your hands, whilst learning. So have you decided between electric or acoustic? Start learning today for free with the online lessons at Guitar Tricks.